Fall means cooler weather and warm muted colors like wine, plum, pumpkin and marigold. It’s my favorite season of all time and I find myself dreaming of pumpkin patches, apple picking and bonfires as soon as the calendar flips to September 1! Since moving to the south however, I often struggle with how to balance my desire to layer on scarfs and jackets the first day of September with the 80 degree temps in Georgia. 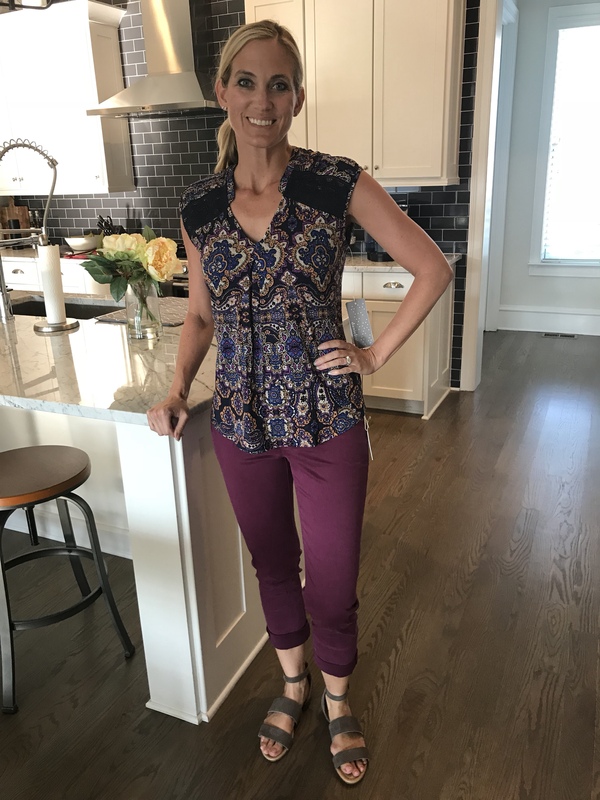 With that in mind, I asked my Stitch Fix stylist to help me out and send me pieces I could layer for early fall and mix and match between work and weekend. If you’re not already familiar with how Stitch Fix works, click here to learn more about the program. So how did my Stitch Fix stylist do? Daniel Rainn is usually on my short list of Stitch Fix brands I love! They have interesting details and patterns and always offer tops I can mix between work and weekend. I was a bit skeptical of this one out of the box. I tend to have a love-hate relationship with anything paisley. I instantly feel my 40-something age as soon as I put it on and if I’m honest, it usually makes me feel a bit school-marmish. 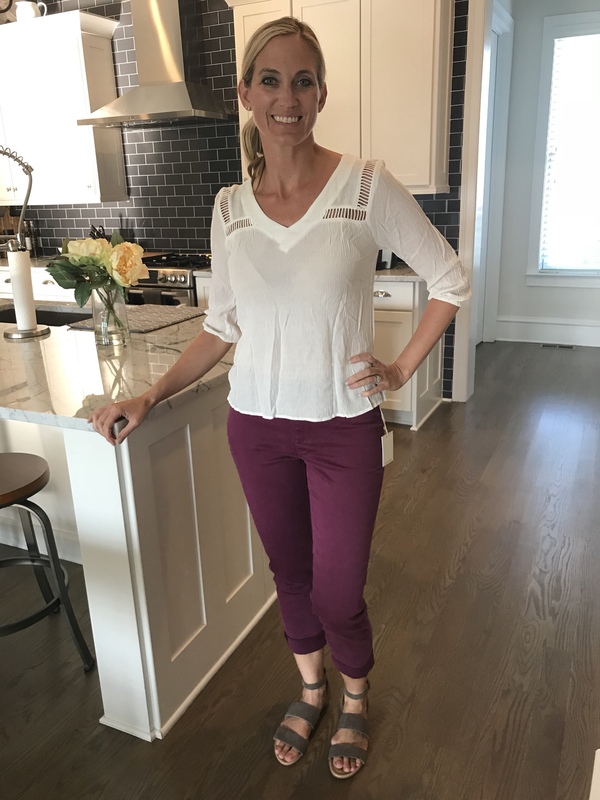 While this top fit great and my husband loved it, I just couldn’t shake feeling a bit frumpy in it. Maybe it’s my imagination or maybe a bit of PMS or both but back it goes. I love anything with a bit of crochet detail that kicks up a basic top or dress a notch. I loved this one out of the box but noticed that it seemed a bit on the thin side and being ivory, I was worried about it being see through. This top even with a beige bra was pretty see through and it fit too tight across my shoulders and chest. I tend to have more athletic shoulders and a 34C so that could be part of the problem. I do think this brand tends to run a bit more narrow in the shoulders however based on a dress I received in a past box. These pants are so soft and the color is really pretty! The color falls somewhere between berry and wine and makes me dream of a trip to a mountain vineyard. I had high hopes for these pants but they ended up fitting me a bit too short which ended up making me feel more like an awkward middle-schooler rather than a trendy 40-something mom. I think they would work better for someone 5’6″ or under and they really are super soft and comfortable. Despite keeping the last black polka dot dress Stitch Fix sent me, I was really tempted to keep this one too. The hunter green color is on trend for fall and I thought it would give a pop of color to my date night and if I layered this with a denim jacket or cardigan,it could be work appropriate. Unfortunately once I put it on, however, the length made it look more skater dress than cute, work appropriate dress that can double for date night. The lines of the dress are really flattering thought and I think it would work great for someone under 5’8″! Verdict: Return (reluctantly… I still dream of this dress 2-inches longer!). These sandals were really comfortable and out of the box, they were totally my style. After deciding not to keep the rest of my items, however, I decided to send these back too. Without the 25% discount, $79 seemed like too much to spend on a sandal for fall, even if it is 80 degrees outside in Georgia right now! Overall, I really did like all of the pieces in theory and think my stylist did a great job trying to balance the heat of Georgia in September and October with fall colors, patterns and textures. I loved the fact that the pieces coordinated for the office and could be flexed for the weekend as well. Unfortunately, some of the fit was a bit off on the pieces otherwise I probably would have kept more of it. As usual, I’m already excited for my next fix! 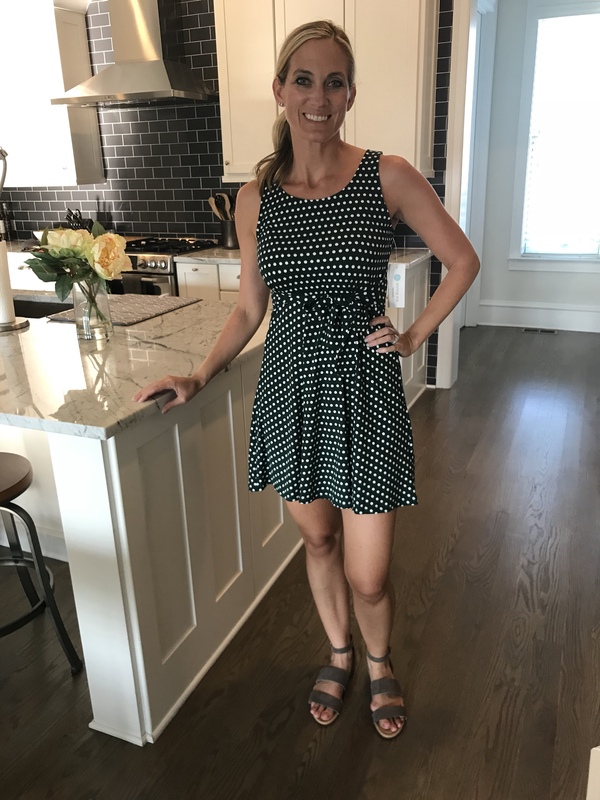 DISCLOSURE: The Stitch Fix link in this post contains a referral code, where I will receive $25 off my next order if someone signs up for a new account using my link. However, all clothing was purchased with my own money and I was in no way paid for my review of these items.